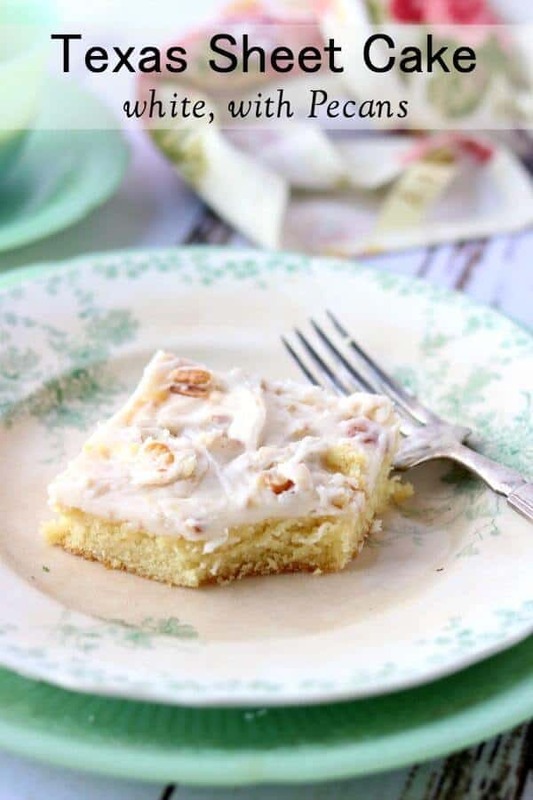 This moist, rich white Texas sheet cake has just a hint of coconut flavor. Made from scratch, it’s topped with a fudgy, candy-like white glaze that’s studded with toasted pecans — it’s even better the second day! This thin, white bite of scrumptious is so easy that it’s the perfect dessert for potlucks, casual get-togethers, and bake sales. Oh y’all. I don’t know who in the world decided that there was such a thing as a white Texas sheet cake – there sure wasn’t when I was growing up. I really fought against the whole idea of the sacrilege of a white version of my childhood favorite – I did. Texas sheet cakes are supposed to be chocolate and, by all that is holy, I was determined I wouldn’t be one to change things. We’re pretty conservative down here – and of course – tradition. That was all she wrote for me. I was a goner – it was SO rich and SO sweet and had the perfect past cake-part brownie texture. So I caved. 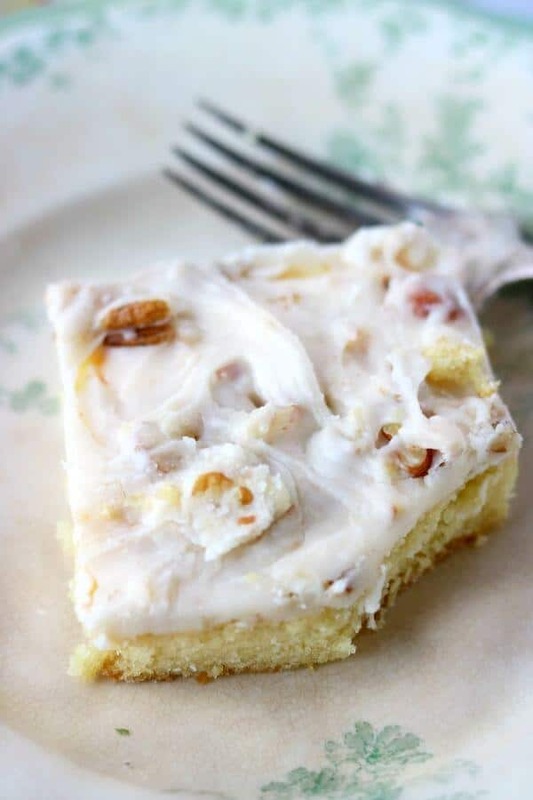 Most of the white Texas sheet cake recipes that I’ve seen call for almond flavoring. I’m sure that’s just delicious but we have ONE nut in Texas (no, it’s not me) and it’s the pecan. Using anything else wouldn’t be right. In fact, it’d be downright disrespectful – so I used coconut flavoring and pecans. Oh yes. I may like this a smidge better than the chocolate version. The cake part is moist tender, perfectly delicious with a delicate coconut flavor. The frosting is like biting into vanilla-coconut fudge with pecans. It’s southern sweet – pairs perfectly with black coffee and neighborhood gossip. Or… take it to a potluck and become instantly known as the “cake lady” (or “cake man” – we don’t discriminate here). I’m telling y’all this is the best cake. I don’t know that I’d use it for a birthday or a fancy party but for a church picnic or anything casual it’s going to be either this or my original Texas Sheet Cake! Still, there are always a few tricks that people use when making a recipe – and so often we forget to share those tips because they are such a habit for us. So – here are my personal tips for making this cake. Use everything at room temperature. If your eggs are cold put them in hot water for a minute or two – not hot enough to start them cooking just hot like hot dishwater. Toast the pecans lightly. I like chop them and then toast them because that way all the sides get toasted. The flavor is out of this world and every time I make something with pecans people wonder what I’ve done differently than they did. It makes a huge difference. Use a heavy cookie sheet with sides. Texas sheet cake should not be much more than an inch thick. If you’ve got a 3 inch thick Texas sheet cake it wasn’t made by a Texan. I use salted butter in this – although I use unsalted in almost everything else. I like the flavor it gives. If you can stand to do it, cover the finished cake and let it hang out on the counter overnight. The flavors really develop. I’ve seen people sprinkle the nuts on top of the Texas sheet cake frosting. Ummm – no. Stir them in so they are part of the frosting not an addition to it. Texas sheet cake is never served with buttercream frosting. Just no. The frosting should be almost pourable and goes directly on the warm cake. If you have to spread it too much the top of the cake is going to tear. Spoon it on and move it around gently. This is a pretty straight forward cake and totally easy to make. Still, a great cookie sheet is essential. This is the one that I use – it’s heavy aluminum, is the perfect size, and has sides. If you love this recipe you may also like these other great sheet cakes! Boston Cream Pie Poke Cake – yellow cake baked in a 13×9-inch pan, poked with holes, covered in vanilla custard, and then topped with a shiny ganache. You may want to consider keeping this one for yourself. Chocolate Sheet Cake – This easy chocolate cake has a whipped chocolate frosting that’s thick enough to get lost in. One of my top picks for birthdays. Lemon Cream Cake – Tangy lemon cake with a whipped lemon frosting is impossible not to like. This one comes with smiles. Pig Pickin’ Cake – Oddly enough there are literally no pigs in this cake. Another southern classic that’ll do your kitchen proud. 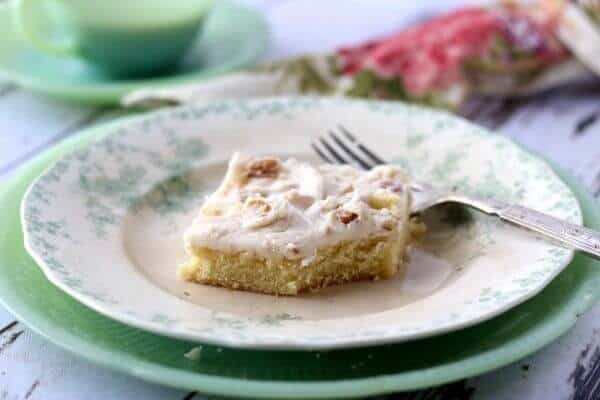 Holy Cow Cake – This concoction will make you say “Holy COW!” or Holy S*** depending on whether your were raised with a bar of soap in your mom’s apron pocket or not. Chocolate cake soaked in Eagle Brand, covered in caramel, topped with chopped Butterfingers, covered in whipped cream, and sprinkled with more Butterfingers. I don’t care HOW good skinny feels – this tastes better. This strawberry sheet cake from Southern Bite is on my radar at the moment. I’m absolutely positive that you are going to love this easy cake recipe for its flavor as well and how easy it is to make. 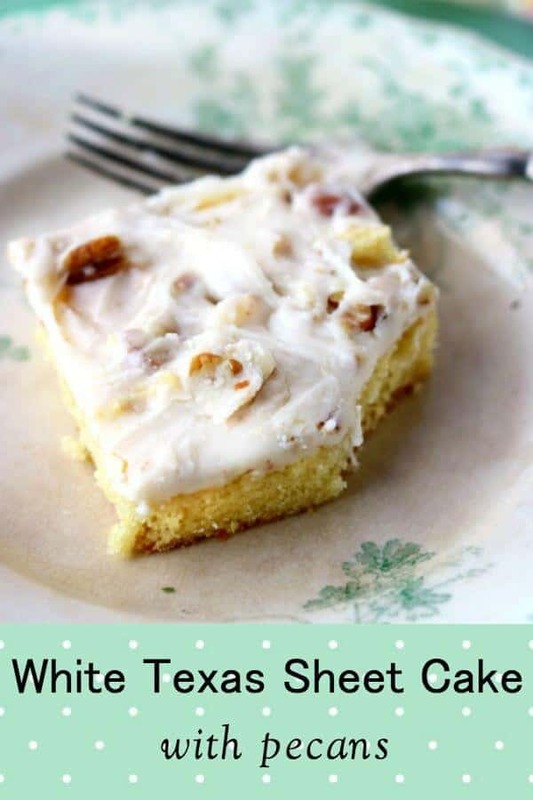 Use the tips above for white Texas sheet cake perfection. Still not what you’re looking for? How about these white cupcakes with whipped cream cheese frosting? If you love this cake as much as I do please give it 5 stars! 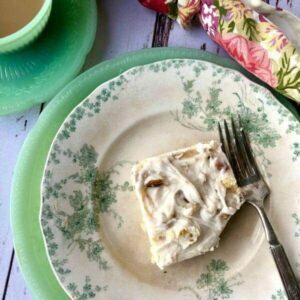 Homemade and rich, this white Texas sheet cake has just a whiff of coconut flavor. This easy cake is topped with a candy-like white glaze generously studded with toasted pecans. A quick from scratch cake that’s the perfect dessert for potlucks, casual get-togethers, and bake sales. Grease a high sided cookie sheet or jelly roll pan and line with parchment. Mix the flour, sugar, baking soda, and salt in the bowl of a mixer. In a small bowl whisk the flavorings, eggs, and buttermilk together. Pour hot butter mixture over flour mixture in the bowl beating on low. Switch to medium and beat for 1 minute. Beat for one more minute then pour the batter into prepared pan. Smooth the batter out evenly. Bring the mixture to a boil, stirring occasionally. Remove from heat and add the Confectioner’s sugar, pecans, coconut flavoring, and vanilla. Mix quickly and spoon over warm cake. Smooth to cover the whole top. You may use almond extract and almonds in place of the coconut extract and pecans. I would cave on this cake, too. About three pieces! Thanks for sharing the recipe! Oh my it is so good. Hi, I clicked your link on Meal Plan Monday. This looks like the perfect cake! I love this one! I didn’t think I would because… chocolate… but it’s now one of my favorites! Guess some Texans are different! I’ve always made mine in a 13×9 to get a good bite of that’s moist dense cake! Frosting is thicker too! And I never use nuts! Been making them this way for for 46 yrs. They’re awesome no matter how you make them! Thanks for the great recipe! Isn’t that funny! I’ve never known anyone to. Live and learn! This sounds so yummy. Just a bit different that the one from Taste of Home in the 90’s. That one had some sour cream in it and almond flavoring – I also liked it better than the chocolate version – perish the thought , but true. Thank you for printing this and will def. make it!!!!!! LOL~ I am always shocked when I like something that’s not chocolate as well as ( or better than ) than something that is.